GoodGuide says Mister Squiggles, one of the Zhu Zhu hamsters, has unsafe levels of antimony. 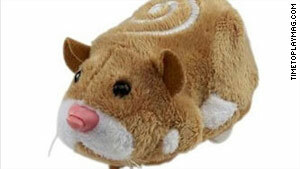 (CNN) -- The maker of Zhu Zhu hamsters, one of the hottest-selling toys of the holiday season, defended its product after a consumer Web site said one of the toy hamsters carries high amounts of a potentially hazardous substance. The light-brown version of the Zhu Zhu hamsters, "Mister Squiggles," has unsafe levels of antimony, according to Dara O'Rourke, co-founder of the California-based GoodGuide. "We found levels of about 93 to 106 parts per million," O'Rourke told CNN. "The new federal standard is about 60 parts per million." Antimony is used in textiles and plastics to prevent them from catching fire, according to the U.S. Department of Health and Human Services' Agency for Toxic Substance and Disease Registry. Prolonged exposure can cause lung and heart problems, ulcers and diarrhea, according to the U.S. Centers for Disease Control. The toy manufacturer, St. Louis, Missouri-based Cepia LLC, disputed GoodGuide's findings and said its products are safe. Bruce Katz, a senior vice president of Cepia, told CNN: "They do not contain high levels of antimony in any way." "None of these tests have failed over the many months we've been producing this product," Katz said. The toys are popular in Europe as well as in the United States. Their British distributor, Character Options, said the products, sold there as "Go Go Pets," are "fully compliant" with U.S. and European Union standards. "In addition, as part of Character Options' standard due diligence, the toy has been further tested on three separate occasions by the company's own safety experts and found to fully comply with all EU standards," the company said in a statement issued Sunday. GoodGuide is a "for benefit organization" that partners with for-profit businesses and addresses social and environmental problems, according to its Web site.